First business impressions are critical. Metal business cards are the guaranteed way to be remembered. "Masterpiece" metal business cards are resistant to scratching and fading. 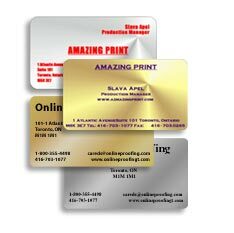 Metal cards are printed utilizing anodizing process on sturdy gold coloured brass plated or silver aluminum. Special die is used to create cards with round corners, dull edges and printed on .011 in. silver shiny aluminum or gold coloured brass plated aluminum. Order as few as 500 business cards.